A Maternal-Fetal Medicine (MFM) specialist is an ObGyn physician who has completed an additional two to three years of education and training. 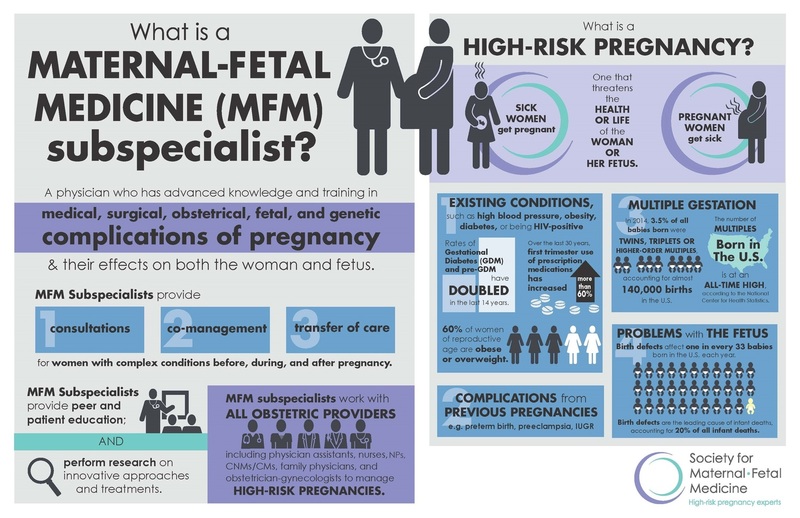 MFM specialists are high-risk pregnancy experts. For pregnant women with chronic health problems, MFM specialists work to keep the woman as healthy as possible while her body changes and her baby grows. MFM specialists also care for women who face unexpected problems that develop during pregnancy, such as early labor, bleeding, or high blood pressure. We’re the go-to for pregnant women who arrive in the hospital for any reason, whether after an accident or at the onset of a kidney infection. In other cases, it’s the baby who faces the un-routine. If we find birth defects or growth problems, we can start treatment before birth, providing monitoring, blood transfusions and surgery to support babies until they are ready to arrive in the world. Download a PDF of the image above by clicking here.